Speaker: Komson Suntheeraporn, Of Counsel, Litigation and Regulatory Team, DLA Piper. Cost: THB400 for members. THB600 for non-members. Price includes drinks and finger food. Pre-registration is required. No walk-ins accepted. E-vouchers are accepted for advance booking only. Please state "e-voucher" in the comment box of the online booking. Cancellation policy: Reservations not cancelled within 2 business days of the event will be charged and invoiced as will no-shows. There have been major changes to the Thai labour or employment laws since 2017. Such changes concern employers obligations regarding human-trafficking, employee rights in retirement and removal of various requirements regarding the reporting of work rules to the Thai Labor Department. This year, the government also intends to introduce further amendments that would have a significant impact on the termination of employees and their rights, calculation of severance payments and leave entitlements. 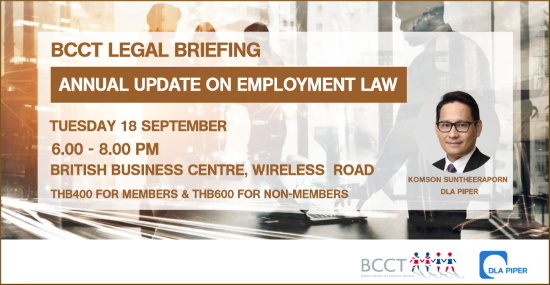 This event will navigate attendees through the myriad of changes and proposed amendments to Thai labour laws. Komson is an Of Counsel in the Litigation and Regulatory team, based in DLA Piper's Bangkok office. Komson is experienced in all aspects of commercial dispute resolution, banking litigation, contentious employment, consumer protection, trade competition, restructuring and insolvency. He has assisted clients in complex disputed matters in arbitration and court proceedings. He handles a broad range of clients industry including banks, manufacturers, construction, transportation, telecommunication and insurance. He regularly advises clients in all levels Thai court and represents clients in domestic and international arbitration.